In the middle of a pour-my-heart-out-to-you lunch with one of my sweet friends, I pulled out my small black cosmetics bag and reached for a small rollerball of oil. As I continued to explain every little detail of a recent life event, I dotted a rich blue liquid onto the finger pads of my left hand, gently gliding the oil and then pressing my right fingers to left to evenly distribute it before inhaling deeply. She watched me, nodding as I continued to spill my story, and then had to interrupt. “That smells amaaaaazing,” she said, and for a split second, I jumped into beauty-blogger-and-product-evangelizer mode to tell her about my favorite new natural chill pill: La Bella Figura’s Travel Therapy Botanical Mood Booster. Though I’d only traveled a block away to my neighborhood Dean & Deluca to meet her for lunch, Travel Therapy Botanical Mood Booster was keeping me grounded during an emotional roller coaster I hadn’t planned on riding. The incredibly comforting scent of Blue Tansy (which I’m predicting is going to be an “it” ingredient this year) transports calm and relaxation to the senses while offering a bright bit of hope to your mind and soul. Blue Tansy is known for its ability to ease nervous tension and stress and has a distinct, floral smell that you can identify from a mile away once you’ve experienced it (think May Lindstrom Skin The Blue Cocoon Beauty Balm Concentrate [review tomorrow] and La Bella Figura Decouverte Under Eye Repair Serum). Travel Therapy Botanical Mood Booster also has strategic cuts of Italian Blood Orange to lift the spirits and stimulate good energy with a hint of Bulgarian Rose Otto to nourish the heart and deliver a restored sense of well-being and self-worth. 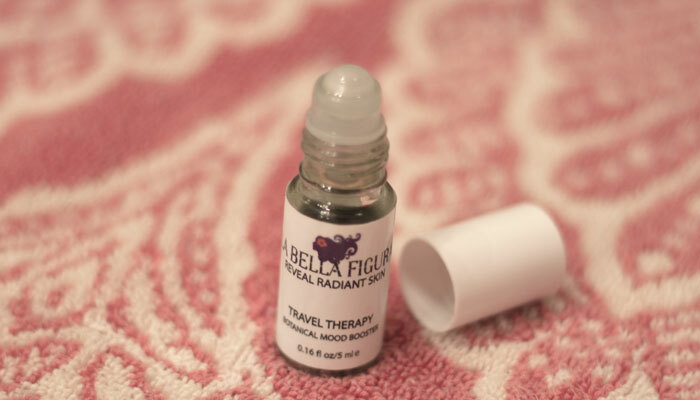 With so many aromatherapy products on the market, it’s hard to name favorites sometimes, but I’m going there and saying that La Bella Figura Travel Therapy Botanical Mood Booster has a permanent spot in my beauty bag. It’s the special blend that’s been by my side during not-so-great times, and as powerful as scent can be, what with memory-triggering and associations, Travel Therapy Botanical Mood Booster reminds me that I deserve to feel happy, calm and loved no matter where life takes me. Have you tried La Bella Figura’s Travel Therapy Botanical Mood Booster? What are your favorite aromatherapy products for relieving stress and tension? Tell me in the comments section!